Until now no research has evaluated the outcome of using vitamin B6 and antidepressants co-administration on depression. Thus, in the current research the effects of three antidepressants including clomipramine, a tricyclic antidepressant (TCA), fluoxetine, a selective serotonin reuptake inhibitor (SSRI), and venlafaxine, a serotonin-norepinephrine reuptake inhibitor (SNRI) were assessed by forced swimming test (FST) as an animal model of despair. In addition to the anxiety behavior, obsessive compulsive disorder was also evaluated. Male mice weighing 25-30 g were housed in cages of six each at 21 ± 2 °C in a 12-h light-dark cycle with the lights on at day time 6 a.m.-6 p.m. Tap water and standard food pellets were available ad libitum. Tests were performed only after the mice had acclimated to the above environment for at least 2 days. In order to minimize circadian rhythm influence, all experiments were conducted between 08:00 a.m. and 13:00 p.m. in the pharmacology laboratory. Minimum of six mice were used for each treatment group. All animal procedures were approved by the Ethics Committee of Isfahan University of Medical Science and performed in accordance with National Institute of Health Guide for the Care and Use of Laboratory Animals. Drugs utilized were as follows: Vitamin-B6, 100 mg/kg (pyridoxine HCl, 100 mg/ml, Caspian Tamin Industry, Iran) (6); clomipramine, 10 mg/kg (Sigma-Aldrich, Germany); venlafaxine, 16 mg/kg (Sigma-Aldrich, Germany); fluoxetine HCl, 20 mg/kg (gift from Pars Daru, Iran) (10). All drugs were diluted by normal saline and injections were adjusted for 10 mL/kg mice body weight. All drugs were administered i.p. 30 min before testing. Vitamin B6 was administered daily for 3, 6 or 9 days in order to evaluate the best timing.Each experimental group comprised of 8 mice as follows: control group, vitamin B6 groups (3, 6 or 9 days), vitamin B6 plus clomipramine, fluoxetine, venlafaxine or vehicle groups. With a few modifications, mice were forced to swim for 6 min in water of 25 °C in a glass cylinder (12.5 cm in diameter)  . The depth was about 12 cm thus the mice could not touch the bottom of the glass beaker with their paws or tail, and they could not escape. After 6 min, the mice were dried carefully and returned to their home cages. Behaviors that were recorded included: immobility time, and latency. Immobility was recorded in the last 4 min and it was defined when the animal was staying still or only using one limb in order to float on the water. Swimming was defined as horizontal movements which involved at least two limbs  . Latency to the first immobility was recorded starting right after placing the mice in the water  . This is a method used to evaluate anxiety behavior, obsessive compulsive disorder. With minor modification from method presented by Njunge, et al. , mice were placed individually in polypropylene cages (42 × 24 × 12 cm) containing 12 clean glass marbles (1 cm in diameter) evenly spaced on 5 cm deep sawdust without food or water. The number of marbles buried (MB) at least two-thirds, was counted after 10, 20, and 30 min , . Results were expressed as group mean ± SEM. All results were analyzed by the student t-test or one-way analysis of variance (ANOVA) followed by Tukey's multiple comparison tests. P values less than 0.05 were considered significant. Excel 2010 and the Graph Pad Prism 6 were used for data analyzing and sketching the graphs. The total time animals were immobile reduced significantly after 6 and 9 days following vitamin B6 administration, 178 ± 10 s and 202 ± 5 s respectively, compared with their corresponding control groups, P < 0.01 ( [Figure 1]A). Figure 1. Vitamin B6 effect on the forced swimming test. (A) the total time animals were immobile during the last 4 min of the total 6 min test, (B) latency in the forced swimming test, time it takes until the animal becomes immobile. Number of animals in each group was 8. Control animals received normal saline (N/S). Results are expressed as group mean ± SEM and analyzed by the student t- tests. **P < 0.01 between normal and treatments. *P < 0.05 between normal and treatments. [Figure 1]B shows that the time until the animals first immobility took place increased significantly after 6 (125 ± 6.7 s vs 105 ± 6 s) and 9 (106 ± 3.9 s vs 90 ± 5.2 s) days following vitamin B6 injection compared with their respective controls (P < 0.05). On the other hand, administration of the vitamin for 3 days did not cause any change on immobility. Since best results were observed after 6 days, that is a drop in immobility time and a rise in latency to immobility, 6 day protocol was used for further evaluations. [Figure 2] shows that using vitamin B6 with each of the antidepressants did not improve their of the antidepressants did not improve their behavior in FST. Although immobility was reduced in its concomitant use with clomipramine (141 ± 15 s) and venlafaxine (116 ± 15 s) but it was not significant compared with the drugs administered alone. 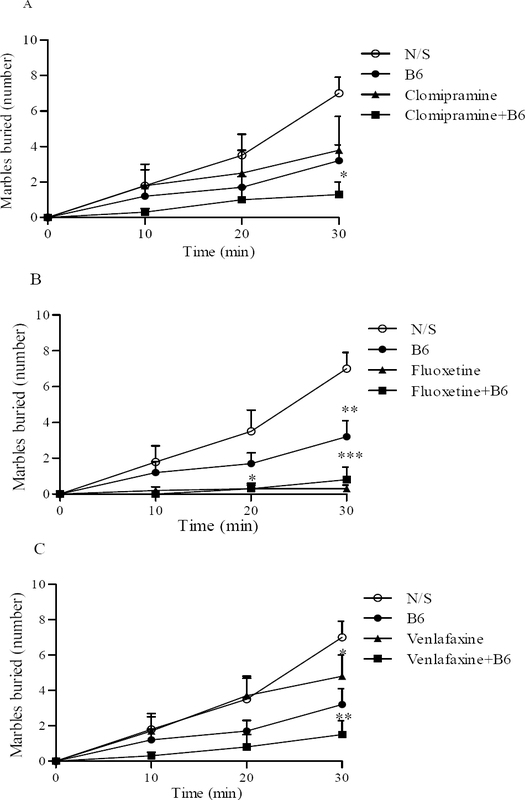 Nevertheless no beneficial response was seen in co-administration of fluoxetine with vitamin B6 compared with fluoxetine alone ( [Figure 2]A). Latency to first immobility was increased, ( [Figure 2]B), but this was only significant with fluoxetine alone, (191 ± 33.7 s vs 88.2 ± 9.2 s, P < 0.001). Figure 2. Effect of vitamin B6 and clomipramine, fluoxetine or venlafaxine on the forced swimming test. (A) the total time animals were immobile during the last 4 min of the total 6 min test. (B) latency in the forced swimming test, time it takes until the animal becomes immobile. Number of animals in each group was 8. Results are expressed as group mean ± SEM and analyzed by ANOVA followed by Tukey's comparison tests. *P < 0.05, **P < 0.01, and ***P < 0.001 between control (N/S) and treatments. 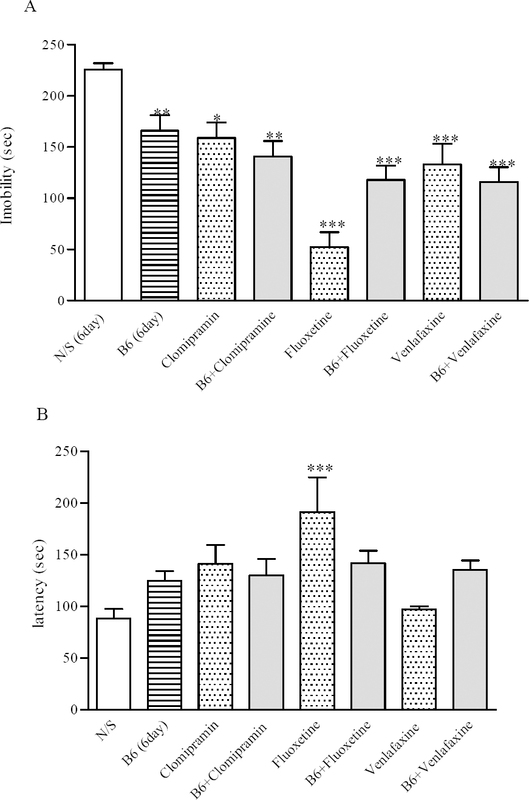 As it is shown in [Table 1], administration of vitamin B6 for 6 days reduced the animals' MB behavior significantly after 30 min compared with controls, (3.4 ± 0.8 vs 7 ± 0.9, P = 0.013). The burying behavior after 3 and 9 days although reduced but they were not considerable (data not shown). The more marbles buried indicates the more OC behavior. Table 1. The effect of vitamin B6 on marble burying test. Interestingly vitamin B6 co-administration with antidepressants reduced the MB behavior, [Figure 3]. Vitamin B6 plus clomipramine reduced the MB behaviour by 77 ± 12% after 30 min compared with controls ( [Figure 3]A). Using clomipramine alone reduced the burying behaviour by 59 ± 18%. Although MB behaviour was reduced when clomipramine administered with vitamin B6 but it was not significant compared to drug alone. Figure 3. Vitamin B6 and clomipramine, fluoxetine or venlafaxine effect on the marble burying test (A, B, and C respectively). The number of marbles at least two-thirds buried with sawdust was counted after10, 20, and 30 min. Number of animals in each group was 8. Results are expressed as group mean ± SEM and analyzed by ANOVA followed by Tukey's comparison tests. *P < 0.05, **P < 0.01, and ***P < 0.001 compared with control (N/S). In Fig. C, # P < 0.05 compared with venlafaxine. On the other hand, administration of fluoxetine alone was very effective in reducing MB behaviour after 30 min (95 ± 3.4%, P < 0.001) and its concomitant administration with vitamin B6 did not indicate any changes ( [Figure 3]B). The use of vitamin B6 considerably reduced the MB effect in animal when used with venlafaxine compared with the drug alone after 30 min, P <0.05 ( [Figure 3]c). MB behaviour was reduced from 32 ± 14% using venlafaxine alone to 83 ± 7% once venlafaxine was co-administered with B6. Our set of experiments proved that administration vitamin B6 for 6 days had beneficial effects on despair in the FST and to some extent it's co-administration with antidepressants increased their beneficial effects. On the other hand, vitamin B6 reduced mice MB behaviour when administered with the antidepressants notably venlafaxine. Using three antidepressants with different mechanisms of actions (TCA, SSRI, NSRI) in our set of experiments showed that they can decrease immobility time in FST. Evidently a single dose of antidepressants could show beneficial results in the FST, as this was also apparent in our experiment  . This confirmed the experimental condition for further evaluation of the antidepressant effects by FST. Fluoxetine also notably decreased the MB behaviour in the MB behaviour test which validated this test for evaluating the obsessive-compulsive behaviour. The metabolism of some neurotransmitters including dopamine, serotonin, glutamate, γ-aminobutyric acid (GABA), and histamine could be influenced by pyridoxine deficiency  . This can cause a rise in the preceding substances such as threonine, glycine, serine, histidine in CSF and perhaps in plasma; raised plasma total homocysteine  . Therefore, vitamin B6 by influencing different neurotransmitters may affect the mood and interact with the effects of other drugs doing so, such as antidepressants (TCA, SSRI, NSRI). The co-administration of vitamin B6 with clomipramine or venlafaxine caused a much less immobility in the animals although this was not significant. Fluoxetine itself showed antidepressant effects and did not show benefit by addition of vitamin B6. Doses examined here were selected according to the ED 50 of the drugs previously measured by Kulkarni  . Since clomipramine and venlafaxine both increase synaptic level of NA and 5-HT but fluoxetine is a SSRI, it could be deduced that vitamin B6 augments 5-HT levels of clomipramine and venlafaxine, although on the basis of our experiment synaptic neurotransmitters were not analysed. Apart from decreased NA and 5-HT levels that are related to depression, GABA deficiency is another cause  . Evidently glutamatergic system especially over activity of glutamate and N-methyl-D aspartate (NMDA) receptors contribute to the pathophysiology of depression  . We previously revealed that vitamin B6 is vital in the GAD activity that catalysis the synthesis of GABA from glutamate  . Therefore, vitamin B6 by increasing the proportion of GABA/ glutamate could also be effective in improving depressive symptoms which demands further evaluations. Evidently in NMRI mice, measuring of the latency to immobility seems to improve the predictive validity of the FST  . Vitamin B6 and the antidepressants increased the latency although this value was considerable only with fluoxetine. It has been reported that rats and mice bury marbles, and this behavior is diminished by low doses of anxiolytic drugs  . Compounds active on 5-HT systems that relieve anxiety, depression or obsessive compulsive, also inhibit MB behavior ,, . Our results obviously showed that fluoxetine reduced MB behavior in mice, therefore adding vitamin B6 to the regimen was not useful. Moreover 6 days vitamin B6 injection concomitant with clomipramine or venlafaxine significantly reduced the MB behavior, although these drugs were effective alone but vitamin B6 augmented this effect. The statement that the test is a model of human obsessive compulsive disorder lacks validity if the normal mice (controls) are the ones showing the irregular behavior  . Thus it does not seem that marble-burying mice are anxious. Gyertyan et al. in their work anticipated that animals are not intentionally burying the marbles but they simply fall through the bedding after digging it  . Therefore, MB measures digging behavior which is partially dependent on hippocampal function  . Hence, the behavior will be influenced by any mediator influencing hippocampus including benzodiazepines and 5-HT active compounds  . To sum up, vitamin B6 as a harmless agent could be suggested in depression and particularly in obsessive compulsive disorder as an adjuvant for better drug response. It could be a helpful supplement for refractory and recurrent obsessive compulsive disorder and depression, which demands more clinical experiments to ascertain. This work was supported by the School of Pharmacy and Pharmaceutical Sciences Research Council (grant number 394699). Murray CJ, Lopez AD. Alternative projections of mortality and disability by cause 1990-2020: Global Burden of Disease Study. Lancet 1997;349:1498-1504. Coppen A, Bailey J. Enhancement of the antidepressant action of fluoxetine by folic acid: a randomised, placebo controlled trial. J Affect Disord. 2000;60(2):121-130. Williamsa AL, Cotterb A, Sabinaa A, Girard C, Goodman J, Katza DL. The role for vitamin B-6 as treatment for depression: a systematic review. Family Practice 2005;22:532-537. Bender DA. Non-nutritional uses of vitamin B-6. Br J Nutr.1999;81(1):7-20. Garelis E, Young SN, Lal S, Sourkes TL. Monoamine metabolites in lumbar CSF: the question of their origin in relation to clinical studies. Brain Res. 1974;79:1-8. Messripour M, Mesripour A. Effects of vitamin B6 on age associated changes of rat brain glutamate decarboxylase activity. Afr J Pharm Pharmacol. 2011;5(3):454-456. Wyatt KM, Dimmock PW, Jones PW, Shaughn O'Brien PM. Efficacy of vitamin B­6 in the treatment of premenstrual syndrome: systematic review. Brit Med J. 1999;318(7195):1375-1381. Skarupski KA, Tangney C, Li H, OuyangB,Evans DA, Morris MC. Longitudinal association of vitamin B-6, folate, and vitamin B-12 with depressive symptoms among older adults over time. Am J ClinNutr. 2010;92(2):330-335. Roberts SH, Bedson E, Hughes D, Lloyd K, Menkes DB, Moat S, et al. Folate augmentation of treatment-evaluation for depression (FolATED): protocol of a randomized controlled trial. BMC Psychiatry. 2007;7:65. Kulkarni SK, Dhir A. Effect of various classes of antidepressants inbehavioral paradigms of despair. Prog Neuropsychopharmacol Biol Psychiatry. 2007;31;1248-1254. Oshima A, Flachskamm C, Reul JM, Holsboer F, Linthorst AC. Altered serotonergic neurotransmission but normal hypothalamic-pituitary-adrenocortical axis activity in mice chronically treated with the corticotropin-releasing hormone receptor type 1 antagonist NBI 30775. Neuropsychopharmacology. 2003;28:2148-2159. Castagné V, Porsolt RD, Moser P. Use of latency to immobility improves detection of antidepressant-like activity in the behavioral despair test in the mouse. Eur J Pharmacol. 2009;616(1-3):128-133. Njung'e K, Handley SL. Evaluation of marble-burying behavior as a model of anxiety. Pharmacol Biochem Behav. 1991;38(1):63-67. Njung'e K, Handley SL. Effects of 5-HT uptake inhibitors, agonists and antagonists on the burying of harmless objects by mice: a putative test for anxiolytic agents. Brit J Pharmacol. 1991;104:105-112. Clayton PT. B6-responsive disorders: A model of vitamin dependency. J Inherit Metab Dis. 2006;29(2-3):317-326. Gabbay V1, Mao X, Klein RG, Ely BA, Babb JS, Panzer AM, et al. Anterior cingulate cortex γ- aminobutyric acid in depressed adolescents: relationship to anhedonia. Arch Gen Psychiatry. 2012;69(2):139-149. Serafini G, Pompili M, Innamorati M, Dwivedi Y, Brahmachari G, Girardi P. Pharmacological properties of glutamatergic drugs targeting NMDA receptors and their application in major depression. Current Pharmaceutical Design. 2013;19(10):1898-1922. Borsini F, Podhorna J, Marazziti D. Do animal models of anxiety predict anxiolytic effects of antidepressants? Psychopharmacology. 2002;163(2):121-141. Li X, Morrow D, Witkin JM. Decreases in nestlet shredding of mice by serotonin uptake inhibitors: Comparison with marble burying. Life Sci. 2006;78(17):1933-1939. Deacon RMJ. Digging and marble burying in mice: simple methods for in vivo identification of biological impacts. Nature Protocols 2006;1(1):122-125. Gyertyan I. Analysis of the marble burying response: marbles serve to measure digging rather than evoke burying. Behav Pharmacol. 1995;6(1):24-31. Deacon RMJ, Rawlins JNP. Hippocampal lesions, species-typical behaviours and anxiety in mice. Behav Brain Res. 2005;156(1):241-249. Gray JA, McNaughton N. The neuropsychology of anxiety (2 nd ed.). Oxford Univ. Press 2000.pp:95-118.